In the Middle Dutch beast-epic Van den vos Reynaerde (‘Of Reynaert the Fox’) a thirteenth-century poet named Willem describes a classical conflict between power and ruse. The orderly world at the court of King Lion is being confronted with the wildernesse of the fox, who walks crooked paths and in a trial is required to answer for his crimes. After the death penalty has been pronounced Reynaert – with a brilliant lied story about the discovery of a large treasure and a conspiracy to murder the king – sees fit to escape his execution and avenge himself upon his foes. Thanks to its careful composition in elegant rhymed verse, its smooth narration style, striking descriptions of characters and sprightly dialogues this Flemish text is nowadays generally recognized a masterpiece. Nonetheless the canonization of Van den vos Reynaerde did not come about until in the course of the nineteenth century. It grew alongside the development of Dutch studies as an autonomous academic discipline and, on the other hand, the nation-building processes within the newly formed states of the Netherlands, Belgium and Germany. No trace of this literary fox can be found in the sixteenth, seventeenth and eighteenth centuries; one knew only of the story as a printed prose text. 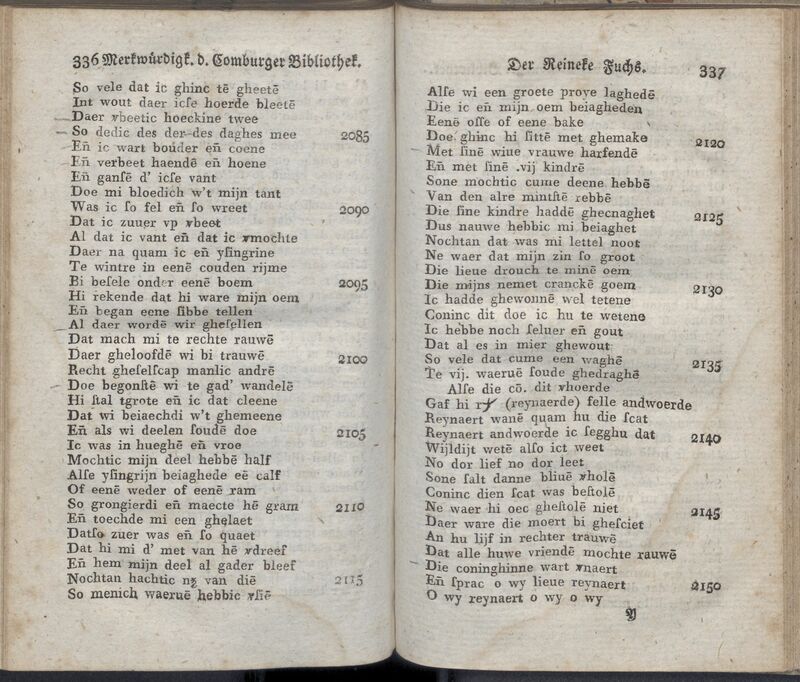 Late in the 1790s a complete rhymed version turns up, not in the Netherlands but in Germany. After having read Goethe’s Reineke Fuchs, Friedrich David Gräter (1768-1830), rector of the gymnasium in Schwäbisch Hall (Württemberg), discovered a medieval manuscript containing Flemish texts in the library of Comburg Abbey, among which Van den vos Reynaerde. In 1806 Gräter mentioned his find in a local publication. However, it was not until November 1812 before he had the text printed in his own journal Bragur, unfortunately with quite a few reading and printing errors and without a proper introduction or commentary. In this manner he succeeded in beating to the chase young academic Jacob Grimm (1785-1863), who in the meantime had engaged in studying the medieval animal epic in all its forms, both in Latin, French, German and Dutch. The copy shown here was acquired early on by the library of the Maatschappij der Nederlandse Letterkunde. And yet the Reynaert edition by Gräter did not generate substantial response in the Netherlands. Of course one has to admit that interest in Middle Dutch texts during these years was still very modest. Occasionally jurists with an interest in history and linguistics had published a Middle Dutch text but in doing so generally stuck to chronicles. With his edition of Van den vos Reynaerde Gräter was the first to publish any Middle Dutch literary fiction of some size and significance. Arguably Gräter’s edition not only marks the beginning of two hundred years of Reynard studies but also the start of the study of Middle Dutch literature in a narrower sense. More about this editio princeps can be found in volume 30 of Voortgang: Jaarboek voor de neerlandistiek. A recent bilingual edition is available on the internet.